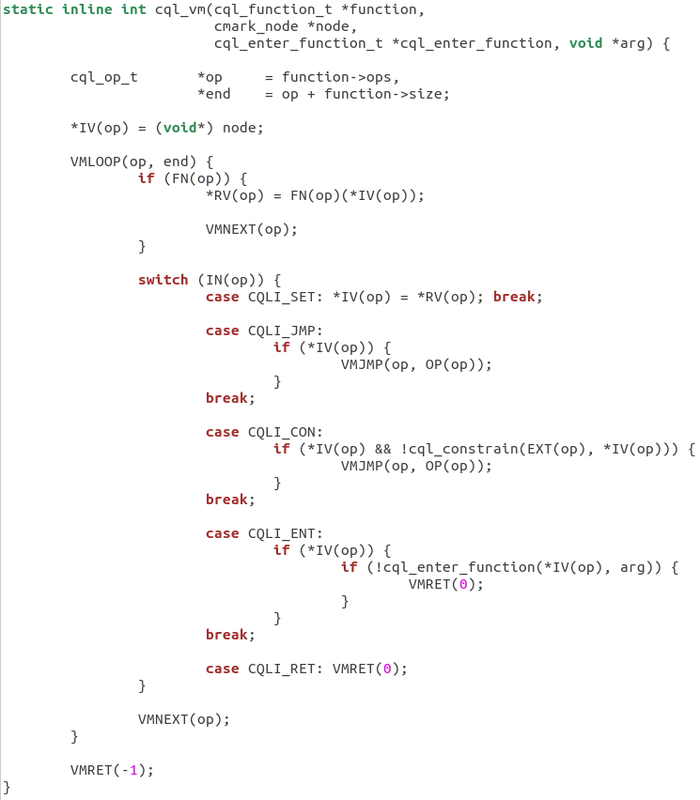 Although phpdbg and XDebug are different from one another, they have some things in common: They are both complicated (to varying degrees), and they are both written in a language that 97% of the people reading this text do not understand (number pulled from air, based on nothing at all). Why do we need a debugger at all? Slightly tangential perhaps ... Debugging is a necessary part of writing code; If you disagree with this statement, then I don't know what you are talking about. 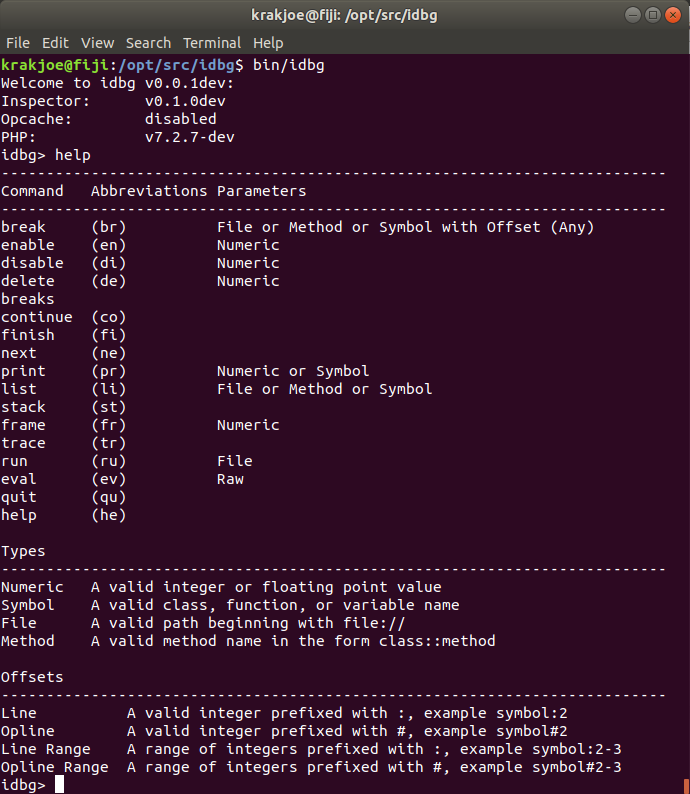 If debugging to you means sprinkling code with debugging statements like var_dump, or print_r, then I implore you to learn how to use a debugger; You are wasting a lot of time. 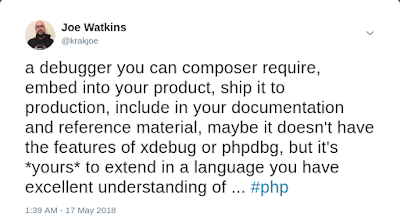 I don't say this from a position of arrogance because I happen to be one of the authors of phpdbg, but from a position of experience; I remember trying to write code before I had a good handle on using a debugger. Sprinkling code with debugging statements is like crouching on a stool in the corner of a cockroach infested room and hoping that blowing upon the blanketed floor will destroy and eliminate the little beasts creating the blanket. 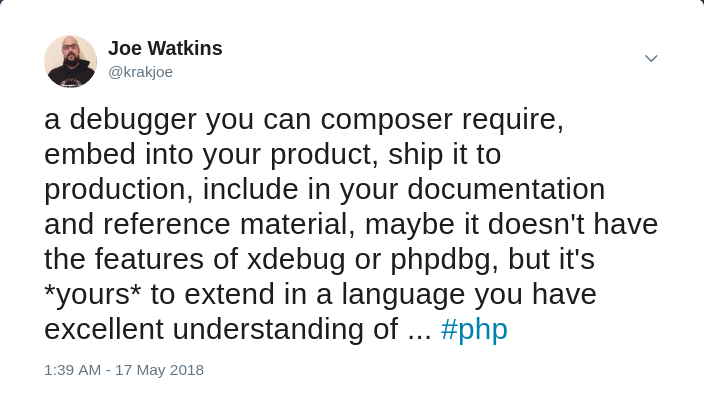 Why do we need a debugger written in PHP ? XDebug predates it's github repository (by a very wide margin), still it doesn't matter for the point I'm trying to make here: In the PHP ecosystem, we have very many very talented programmers, with a whole host of knowledge about how the PHP engine works - they may have been using it for their entire professional career - they are able to write and contribute to arguably comparatively complicated software like PHPUnit or phpstan. Alas we have vanishingly few programmers in the ecosystem that are able to improve, fix, or develop in any way software like phpdbg or XDebug, and I think it's mostly because of the language they are written in. You might also just like to scan the number of contributors to projects like Laravel and Symfony ... although I think these numbers less relevant, they are surprisingly high. I don't know how obvious it is that it's not reasonable to talk about implementing a debugger entirely in PHP; The kind of control you need over the engine just isn't reasonably attained in userland by default. The debugger itself, the thing that interacts with a person or an ide can be written in PHP alone, and is much easier to write in PHP. But the core of the "debugging engine" (terminology borrowed from dbgp specification) should be written in C.
krakjoe/inspector is a disasembler and debugging kit for PHP, it exposes the necessary API for the development of a debugger in userland. It is an advanced extension of the existing Reflection API, giving it a shallow learning curve for anyone already familiar with Reflection. While it's annoying that we still must have a binary dependency, I'm hoping that inspector becomes a defacto part of php installations in the not too distant future. Although I have no intention of making an RFC to merge inspector into core - it belongs outside of core, the release cycle in core does not lend itself to new software and there is nothing to be gained by merging. Being a defacto part of installations doesn't necessarily mean merged into core. There is much to do and you shouldn't design your workflow around this (or any alpha quality software) yet. 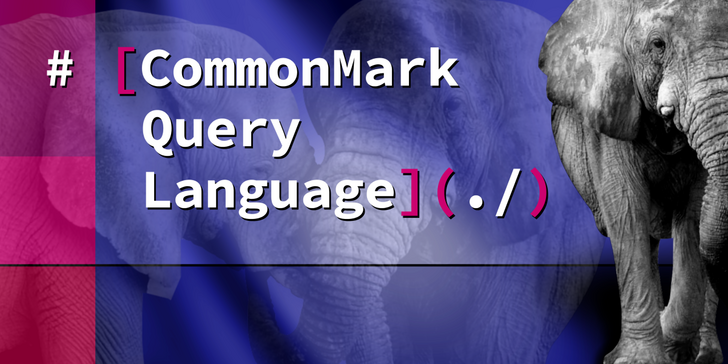 Recently I have been working on a CommonMark extension for PHP7. It is based on the reference implementation in C, linking to it rather than re-implementing the spec. The reference implementation in C is extremely fast, and so the extension has a focus on performance, trying to create PHP objects only when necessary, among other (boring) optimisations. In C the iterators provided by the reference implementation are extremely fast; It simply doesn't matter that you might have to accept every node in a document when you're working in C. In a dynamic language like PHP it really does matter, even if the objects representing the nodes are short lived. Again when you access a parent or child node in C, you are just doing pointer arithmetic (hidden behind function calls), it's all simple stuff. When it comes to a dynamic language there is all kinds of baggage attached to the object (and even the read operation itself), additional allocations and other such instructions must be executed before the C pointer can be passed into user land. While the iterators from the reference implementation are fast, they are not smart - they don't really need to be, as explained. When it comes to inspecting a document (before conversion for example, or for editing), the kind of code you need to write in any language consists of complicated nested loops and or recursive calls, it's long and complicated, and difficult to get right. 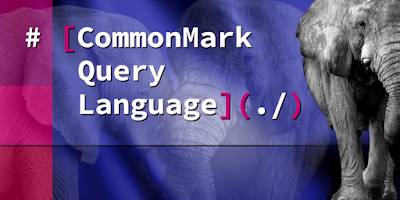 CQL - CommonMark Query Language is a feature that has been developed alongside the CommonMark PHP extension, which solves some of the problems of iterating through a tree structure in a dynamic language by allowing the user to express as a string how to travel through the document and which nodes to return. 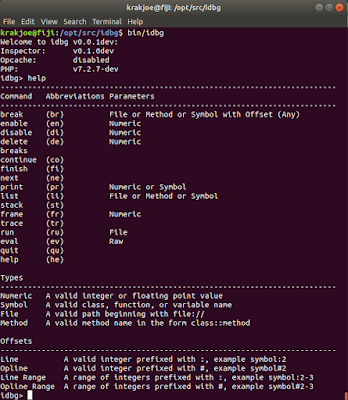 CQL consists of a lexer and parser, a compiler for a small set of instructions, and a virtual machine for executing the instructions. The above query will return the children of the first child node of a tree. firstChild, lastChild, parent, next, previous, and children are all accepted paths. The above query will return the children of the children of the first child node of a tree. The above query will return the children of the first child node of a tree that are BlockQuote objects. 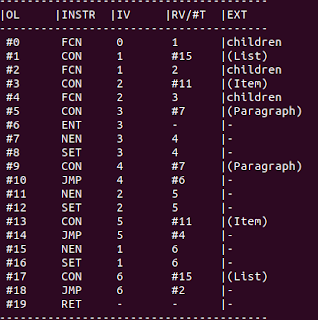 The above query will return the children of the first child node of a tree that are BlockQuote or Paragraph objects. The above query will return Paragraphs that are children of BlockQuotes that are children of the first child node of a tree. Constraints and sub queries may be nested ad-absurdum to describe a path to take through the tree. 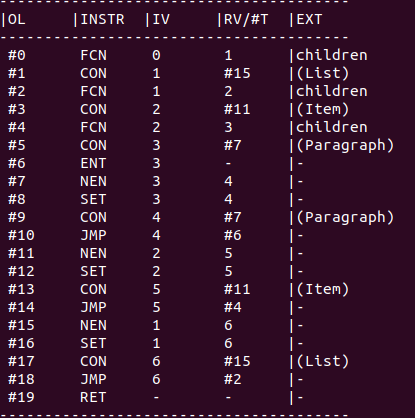 The form of the queries I have used here is for readability only, whitespace is ignored, and content after # is ignored. Each instruction has an input value (IV), and an output value (RV) or JMP target (#T), in addition it has an extended value (int) for storing constraints, and probably other things in future. For simplicity, you can consider the numbers in IV and RV columns variables, the first instruction FCN sets 1 to the first child node of 0, the second LCN sets 2 to the last child node of 1, and the third instruction ENT dispatches a call to the caller of the function with the address of the node at 2. Remembering that these "variables" are just addresses, no zvals, no php vars, all very low level stuff. The first instruction FCN sets 1 to the first child node of 0, the second instruction sets the first child node of 1 to 2, the third ENT dispatches the enter call. The next instruction NEN sets 3 to the node next to 2 in the tree, the next SET instruction sets 2 to 3, and the next JMP jumps to ENT if 3 is positive, creating a loop until all the children are consumed. The only new instruction is CON, which will skip nodes that do not match the constraint given. Making execution of the query extremely efficient, much more so than you would be able to write in PHP. and will be invoked by CQL on ENT instructions. I am not finished writing tests for CQL yet, so it currently lives in a feature branch. It will be included in the next release of the extension, probably in the next couple of weeks.